The two sling stones and the note explaining that they "brought nothing but trouble" to the anonymous robber. Two stones were returned to the Museum of Islamic and Near Eastern Cultures in Be’er Sheva. The artifacts were accompanied by an anonymous note. 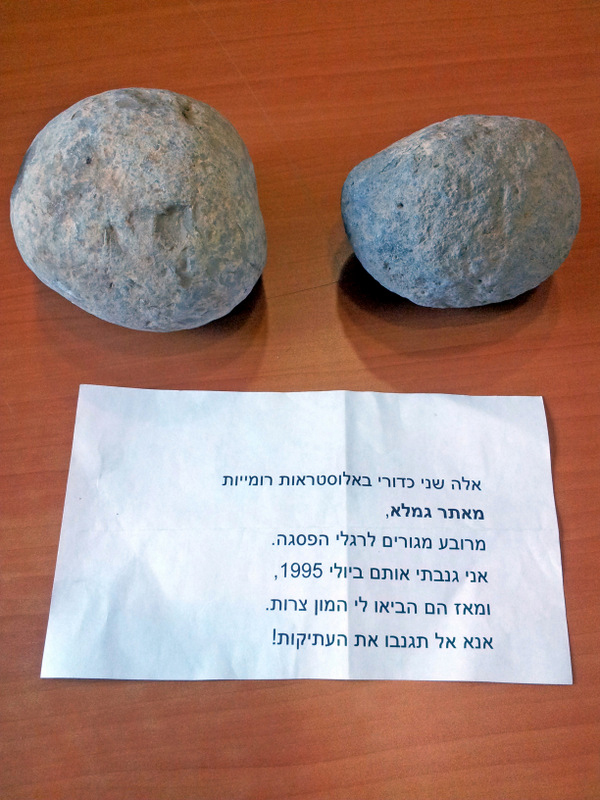 Amos Cohen, an employee of the Museum of Islamic and Near Eastern Cultures in Be’er Sheva, did not believe his eyes when he opened a bag left in the museum’s courtyard: two sling stones were laying in the bag and a typed noted written by an anonymous individual that read, “These are two Roman ballista balls from Gamla, from a residential quarter at the foot of the summit. I stole them in July 1995 and since then they have brought me nothing but trouble. Please, do not steal antiquities!” The museum director, Dr. Dalia Manor, reported the finds to the Israel Antiquities Authority and soon these stones will join other ballista balls from Gamla that are now in the National Treasures Department. Many other stones such as these are now on display in the Gamla Nature Reserve. This is not the first time antiquities are being returned in a gesture of remorse. In the past a 2,000 year old Jewish coffin was returned to the Unit for the Prevention of Antiquities Robbery. It had been kept in the bedroom of a Tel Aviv resident until he realized the morbid meaning of the find. In another case a minister from the state of New York asked for forgiveness for a member of his congregation whose conscience was tormented by the fact he took a stone from Jerusalem more than a decade earlier. The stone was returned to the National Treasures. Dr. Danny Syon the Israel Antiquities Authority, who excavated at Gamla for many years, welcomed the return of the stones. He said, “Almost 2,000 such stones were found during the archaeological excavations in the Gamla Nature Reserve, and this is the site where there is the largest number of ballista stones from the Early Roman period. The Romans shot these stones at the defenders of the city in order to keep them away from the wall, and in that way they could approach the wall and break it with a battering ram. The stones were manually chiseled on site by soldiers or prisoners”.